Before any design is executed there are several steps that need to be followed in order to have a successful design. For example, once we had our non-profit organization selected, we began by researching similar organization websites to gain ideas and to see exactly what they do. Since the Internet is one of the most powerful tools accessible, we used it to our benefit. After gathering ideas, we began sketching so we could visualize which direction we wanted to go in. 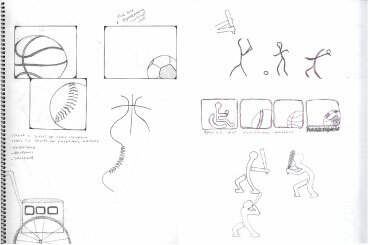 The sketches (as you can see) came from the idea of using icons (a more informational approach), which derived from the Olympic event symbols. After our sketching process was over, we transferred our artwork into the computer and started the refinement process. After the sketches were refined and adjusted, we began to make arrangements on readability, specifically, whether it should be stacked in a vertical or horizontal line. Upon finishing the design, we began to work around a grid system, which included the following: Header, Design, Content, and footer. 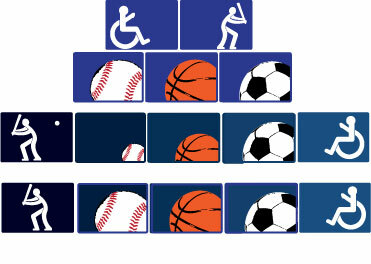 The layout turned out to be a challenge because the design was in a horizontal format that covered a large portion. We ended up adjusting the design by making it smaller, but the content was still recognizable. The next task was to add the informative text and place it into a spot, which could get confusing with the logo. We solved that problem by downsizing the type in the content and adjusting margins around the content with respect to the actual document printing margins and the design borderlines. In conclusion, we finished our “Sports For Exceptional Athletes” poster and we all felt confident that it turned out to be successful. This challenge turned out to be a learning experience that we as students don’t get from our design classes. Working as a team also turned out to be key in our success for design in the sense that we all contributed ideas that lead to our final design.